Vacation is about to officially begin. Once I get through an enormous stack of back logged charts that are 100% my fault for not doing the two weeks prior to my board exams. I would have gotten more done this week but with nightly softball tournaments Monday through Thursday it didn't happen. So it is 2 pm on Sunday afternoon and I'm doggedly working my way through my stack. I will have to go into work to then put them into the work computer system. Then I'm going on an Alaska roadtrip! Tomorrow at lunch time my Aunt and a coworker from her job are flying into Anchorage. From there we will begin an Alaska adventure. Yes, I live here but I haven't explored any of the southern part of the state. That's the "pretty" part you see on TV and such. We will have a scrumptious lunch at the local pizzeria in Anchorage called the Moose's Tooth...great pizza and better beer! It's where I celebrated lasts Friday at after the test. 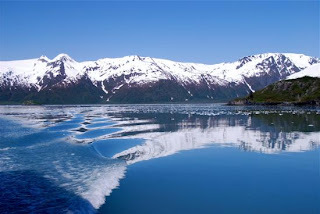 We will then head south to Homer, AK. Home of the Salty Dawg Saloon and miles and miles of ocean. We may or may not do some fishin' while we are there. A night in Homer will do us good and then we are off to Seward, AK. 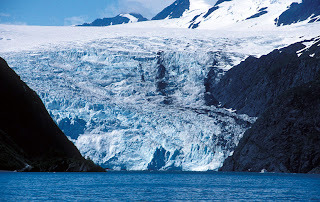 We will make sure to check out the Marine Life Center before our second day takes us on a 9 hour cruise of the Kenai glaciers with whales, sealions, seals, and more. Glacier calving will be the highlight for me...I can't wait to hear the crash of the breaking ice as it falls into the bay. Could be a bit chilly though. We will relax in Fairbanks after driving home on Friday for the long weekend. Monday afternoon we will start the slow drive back to Anchorage with a two day delay in Denali National Park. Some light hiking, bus rides to the end of the road, and a dog sled adventure await. Should be fun...now to finish these darn charts! Homer Spit...We are staying at the tip of that piece of land. 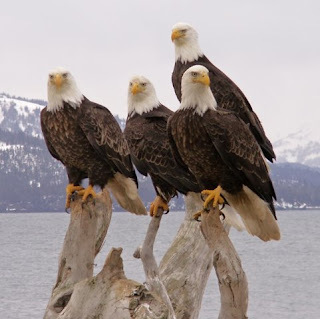 Bald Eagles abound thanks to conservation efforts of locals. Snow capped shoreline near Seward. Incoming Glacier straight to the Bay! "Who knew?" That was the response I got when the girls came to pick me up for the party on Saturday night. I wear scrubs three days a week. That's typically what they see me in. When we get together to scrapbook we are all in sweats and such. They didn't know I had THOSE! Doesn't my new dress for under $20 shown them off well? Happy HNT! The last five weeks I have been consumed. Consumption is not a good thing. They once named a deadly disease "consumption". It takes over ever waking and sleeping moment. It causes you to toss and turn. You doubt yourself. You question your abilities. You become consumed in all aspects. I was consumed by the preparation for my PANRE. The PANRE is a standardized test required by the NCCPA to be taken by all Physician Assistants every 6 years to maintain our national certification to then allow us to be licensed. First, I can't believe it's been six years since I took the first one. The whole period of a couple months around that time of my life is a blur. To say it was stressful would be an understatement. My husband had left me, I had no money, I had no job lined up, and I didn't know what was next. This time my stresses were minor...the Army forgot to pay for my plane ticket and I didn't find out until I went to check in for my flight. The hotel sent me to the wrong room that wasn't cleaned yet. The testing center wasn't open when I got there extra early on Friday. Those things seem so minor now. Second, I didn't feel like I had put the time into studying that I needed to. I laid in bed the night before the test thinking to myself all the stuff I didn't get too. I laid in bed the night after the test second guessing all my answers. The difference between recertifying for the first time is that it's all fresh in your head from school and you don't have anything to do but study. This time I had to go to work, go to softball, take call, etc. I couldn't sit for hours and hours and outline things. Well...a mere three days after taking the test I got my results. I passed! I am nationally certified to practice as a PA for the next 6 years. No more studying cardiology and nephrology for another six years! What a relief! The consumption is over! Last night I came home to find a second story screen window popped off and had a head count of TWO instead of THREE kitties. Montana was AWOL. I spent nearly two hours in the yard last night calling for him and searching through the grasses for him in case he was hurt and couldn't come to me. Around midnight last night a game of kitty Marco Polo began and I found my kitty in the raspberry bushes. Yeah, didn't know I had raspberries in my yard. I have LOTS of raspberries. All along the south side of my house and to the north of my storage shed. Thick bushes loaded down with berries. So today after reminding kitty he can't go outside and making sure the screen was secure, I went outside for some treats. They don't get as big as the ones you buy in the grocery store but they are packed with sweetness. I'm going to take a shower and have some fresh berries on ice cream for supper. Happy HNT! I took a little time to enjoy the view when I made it to the top this weekend at Savage Rock in Denali National Park. Truly a national treasure and only a 2 hour drive down the road! A good pair of Keen's and a sense of adventure is all you need! Happy Trails...Happy HNT! 8 years ago this month I said I do. Six years ago last month it all came on done. I have been through a lot since then. I have grown and matured. I have reflected and don't cry about it anymore. But I hadn't gotten rid of the ring. It laid in my jewelry box for the last 6 years through 3 or 4 moves. This past Valentine's Day (the anniversary of when he first cheated on me) I finally pulled it out of the drawer and took it to several jewelers. At the time, the offers weren't what I wanted. As much as I wanted to let go, I wanted it to be done fairly. A couple weeks ago a friend and I were shopping for Alaska jewels and went to a different store. I happen to have the ring in my purse still so I turned it in to them to see what they could do for me. When I got back from Chicago, I stopped back in to see. They were the first jewelers who agreed to pay me for both the gold and the diamonds. I could take a cash value OR have TWICE cash value in store credit. My first set of diamonds that I purchased for myself. I picked them up about 10 days ago and I haven't taken them off since. They sparkle and swing and catch the light. Aren't they beautiful?